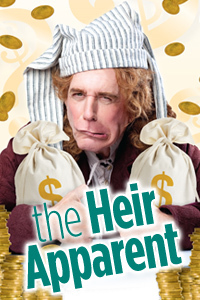 The Heir Apparent is an absolutely delightful evening of comic theater: an ingenious set, beautiful costumes, muscular direction, an ensemble cast with no weak links, and Floyd King, the consummate clown, outdoes himself. Mr. W. and I laughed all evening. What I really want to praise, however, is the script, "adapted" from a play by Jean-Francois Regnard, who was sort of the Johnson to Moliere's Shakespeare in French theater. I use the scare quotes because what playwright David Ives has actually done is more like co-write an entirely new play. That's Regnard, but it is equally what David Ives has achieved in English with this adaptation. What a treat for anyone who loves wordplay and loves the English language! It's no fluke, either, I was equally impressed with his similar treatment of the script for The Liar last season. The cast makes the most of the script with spot on timing --the rhymes never get in the way-- but it's Ives I came away impressed with. What a talent!